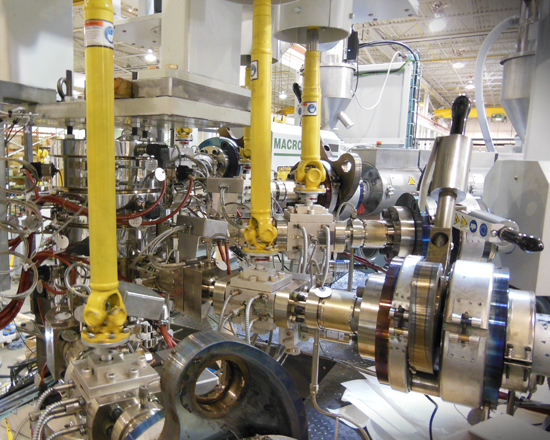 Macro's high speed coextrusion line for producing biaxially-oriented (biax) sausage casings is configured in a three-bubble arrangement to efficiently extrude, orient, and anneal the film with tight control of final film properties. 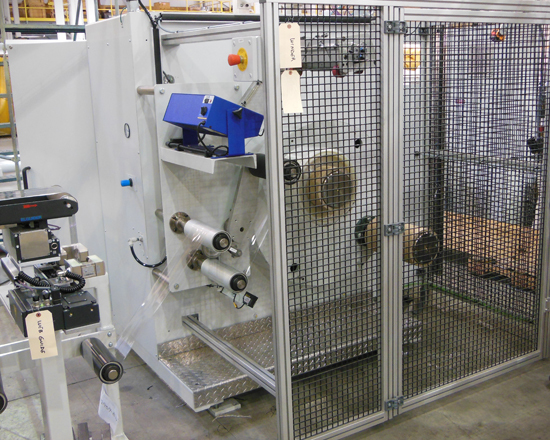 The line can be configured to produce coextrusion casing structures up to 9 layers using PA (Nylon), PE and EVOH. It can also be modified to allow processing of film structures with PVdC. 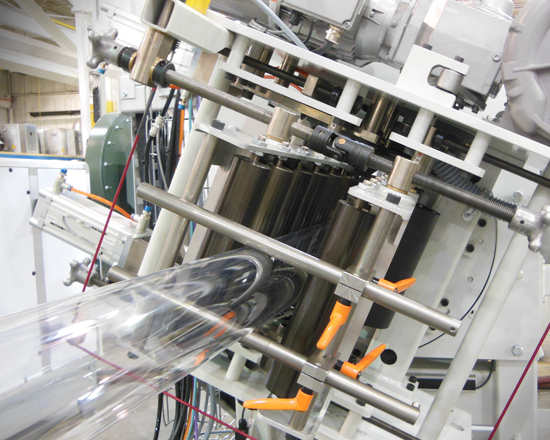 Should the need arise, the line may be readily converted to produce biax films for barrier shrink bag production. 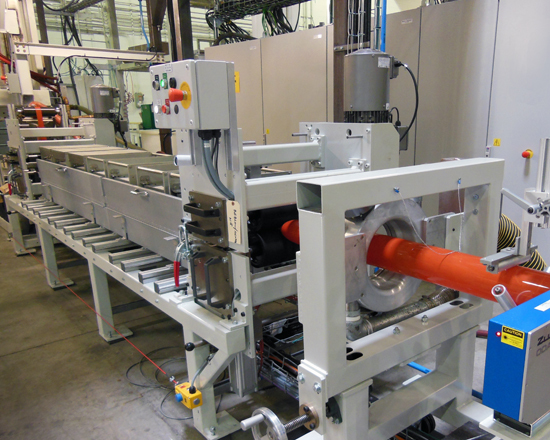 The biax sausage casing line produces casings up to 9 layers with width calibers of 35-180 mm and thickness ranging from 35-60 microns. The line operates at speeds up to 170 m/min. The line includes a primary bubble forming section with a vacuum calibrator. The bubble is blown and oriented with the aid of a infrared heaters. Annealing is achieved in an infrared annealing oven. The bubble's diameter is precisely measured and controlled in each section to ensure consistent product quality. The line includes a gauge randomizer and a two-spindle center winder. An advanced control system contains recipes for automatic ramping (up and down) of line speed with simultaneous adjustment of up to 30 process parameters. This ramping procedure not only automates tasks of the operator but also shortens start-up times to save the processor valuable costs related to resin and energy consumption. 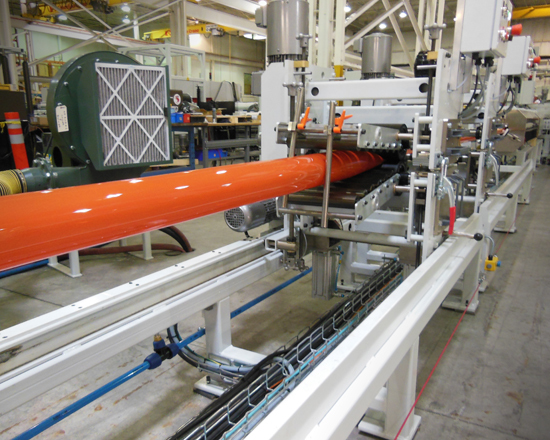 For more information about our casing extrusion technology contact us!